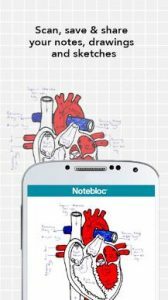 Notebloc : Download our app to scan, save & share your notes, sketches, drawings, and other documents. You can export the documents to PDF or JPEG files. Notebloc® is a free scanner app supporting unlimited usage, developed by a notebook company in Barcelona. You can scan ANY type of notes, paper documents, drawings, sketches or images. The app will automatically detect the corners and correct the perspective of the image. Making it appear as if it was taken with a 90 degrees angle. Any shadows or similar will disappear. You can crop a document or image directly inside the app. Documents can be classified in folders and/or shared through email / Whatsapp / Dropbox etc. When used in conjunction with our Notebloc® notebooks, you get optimal results. The gridlines and background of our paper will magically disappear. Notebloc is the brand of notebooks of the 21st century. All our products are designed for those who write and draw on a daily basis. Therefore Notebloc notebooks are printed with our unique inverted grid and they are all compatible with our app, which lets you scan and digitize your sketches, drawings and notes, transform them to PDF or JPG with a simple click, share them online and access them from any device and from anywhere. This will all greatly expand the horizon of your notebook and get your Notebloc experience beyond what you could imagine. You can transform our inverted grid into a white background: The inverted grid of Notebloc is an excellent, creative and functional support that will help you in your writing and drawing processes, but our application will eliminate the grid when you digitize your Notebloc. We know that this is going to make you feel more comfortable for editing your content, tweak or re-read it from electronic devices. Use the app and see for yourself! We correct the perspective of your captured piece of paper: Notebloc geometrically fits your photos (see example above), making that the image on the screen completely straight, as if you had taken the picture in a perfect 90 degree angle. We eliminate any trace of shade in your photos: Imagine you could have the perfect light intensity to digitize your notes in any circumstance, time and place. That may seem impossible, but with the Notebloc app your digitized notes will look perfect, clean, without any imperfection due to light and shadow. In your digital image you will only get what you’ve written or drawn on a completely white background. Create documents and save them as PDF or JPG. Share documents online: e-mail, instant messaging, social networks, etc. Classify documents by date of creation or edition. Choose in what size of PDF you want to keep your notes. Digitize images / other documents that you may want to save along with your Notebloc notes. Add, copy and order pages within the same document. Create folders to better organize your files. What is the inverted grid paper by Notebloc®? As the name suggests, it is a grid, but printed in reverse. We know that the lines are suitable as support for writing, drawing, sketching, etc. But we also know that gridlines may not be suitable for a final result of a piece of work. Gridlines are fine… But what happens when you finished your notes or sketches and you no longer need this great support? Well, the lines are still there and may interrupt the text, drawing or diagram. With Notebloc® this is solved. The pale tinted background of our sheets improves the contrast between the ink and the paper. Your notes and sketches will stand our more than in any traditional graph paper, and it will be more comfortable for you to review and revise your notes. And when digitized with our app, the gridlines will completely disappear. Try our notebooks and experience the concept yourself: you will wonder why you didn’t know about us earlier! This app is better than advertised. The ogranization system and it’s convenient ability to rapidly export as a pdf is very good. The photo adjustment and filters are very, very excellent. This app shortens the time it takes me to turn in handwritten assignments online by literally 15 minutes. Before, I would have to snap photos, email it to myself, adjust them in Photoshop (the levels adjustment can’t even get it this good), stitch them together as a pdf, then turn it in. It does all that work for you! We are very happy to read how Notebloc helps you! Thanks for sharing your experience! Honestly an amazing app which helped get me through AP physics. I didn’t use it much, but it’s truly great. I don’t know how much I’ll use it in the future, but i upgraded to the newly added pro version just because of its usefulness. Keep doing what you guys are doing! The best I’ve used so far for capturing PowerPoint slides at conferences. It’s a shame there is no companion software for pc (not bluestacks). Perhaps a dedicated PowerPoint template would be great too 😉 Keep up the good work ! !